How are you? Well, June School holidays are over!! Time to be busy again, bringing kids to and fro schools, tuition centers, enrichment programs etc. And of course, time for my crocheting adventure to start. Yup, its a very portable hobby, meaning I can bring the crochet hooks and yarns with me anywhere to crochet while wait for kids. Thats one major reason why I'm so hooked!! 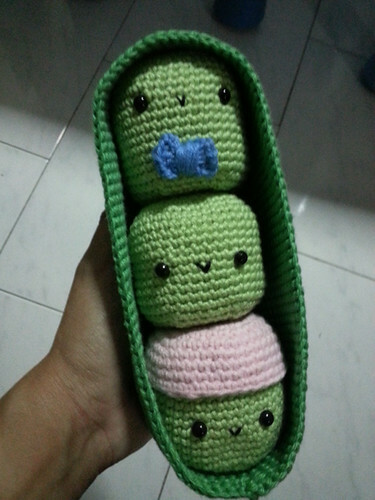 Today I want to share Peas In A Pod amigurumi with you. It took me about 2 weeks (note: I didnt do the whole day for these 2 weeks tho) to finish it. And my whole roll of green yarns are almost used up. But they are so so adorable!! I got lots more to share with you. And my crochet supplies have since multiplied from none to few boxes of yarns, a complete set of hooks, tons of safety eyes and amigurumi books!!! I hope to encourage you to crochet. Its such a portable and fun hobby. And I plan to incorporate some creations in my scrapbooks!! Maybe a crocheted flower?? Or alphas?? Or crochet the edge of papers? Hope you be inspired. Thanks for visiting my blog. 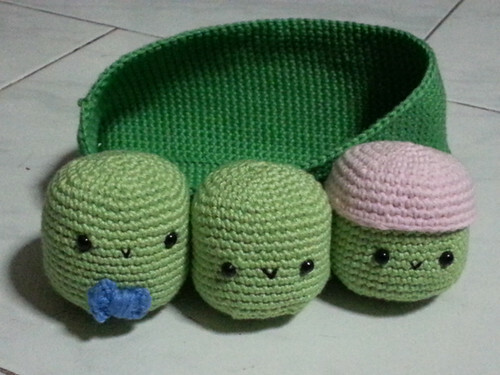 Green Tea Pudding and Cupcake Amigurumi!